Convert MOV to AVI on Mac and another 1000+ output formats easily. Edit MOV files with cropping, trimming, rotating, adding watermarks, applying effects, etc. Burn MOV to playable DVD with free DVD menu templates. Download YouTube videos and convert to MOV/AVI format easily by pasting URLs. Even though MOV format is Apple’s default video format, sometimes you may want to forward a video to a friend, family member or a coworker who use Windows operating system, and their computers wouldn’t be able to view MOV files, since Microsoft devices don’t support MOV. MOV won’t be recognized on some other devices, such as Android-based devices or your PSP, in this situation, AVI format would be a better choice. So in this article, you'll learn the best method to convert MOV to AVI Mac and Windows, also the free MOV to AVI converter. If you want to convert MOV to AVI on Mac OS without much fuss, you should use software that is fast and reliable, and that doesn’t damage the original quality of MOV file in the process of conversion. One of the best converter software for Mac that you can find is Wondershare UniConverter (originally Wondershare Video Converter Ultimate). It helps you convert MOV files to AVI on Mac with 3 easy steps easily and quickly. It has no competition on the market, because it supports a wide range of video formats, namely, you can not only use it to convert MOV to AVI, but choose from over 150 other video formats the software support. Moreover, it offers significant features like easy-to-use editing tools, which help you enhance and customize videos any way you want. With just one click, you can use Wondershare UniConverter to download videos from YouTube and many other video hosting websites, which gives you the opportunity to fully enjoy any favorite videos offline. Convert MOV to AVI on Mac with super fast speed and high-quality output. Support 1000+ video and audio formats for input and output such as MP4, MOV, AVI, MKV, WMV, etc. Edit, enhance & personalize your MOV files with real-time preview. Transfer converted AVI files to external devices easily via a USB cable. Burn MOV to DVD and customize your DVD with free DVD menu templates. Download or record videos from 10,000+ video sharing sites and convert to MOV/AVI. The process of converting MOV to AVI is very simple, and it won’t be a problem to easily convert files, no matter the level of your previous experience with converter software. But to make things even easier, here're the video tutorial and step-by-step guide on converting MOV to AVI on Mac. At the very beginning, you should first download and install Wondershare UniConverter (originally Wondershare Video Converter Ultimate) on your Mac, and then watch the video tutorial or follow the simple steps. Windows users can also follow similar steps. 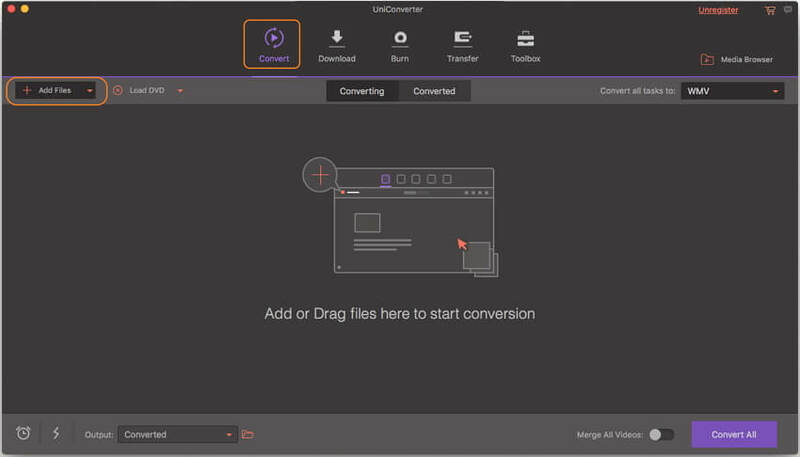 Launch Wondershare UniConverter on your Mac after installation, click on the Add Files option to import the MOV video (or videos, you can choose multiple files) you wish to convert. Click the down arrow button from the Convert all tasks to: option and select Video tab, choose AVI in the left sidebar and select the video resolution in the right to confirm the output format. The last step is to click the Convert All button to start converting MOV to AVI on Mac. In a matter of seconds, your MOV files will be converted to AVI format and you can find them from the Converted tab. 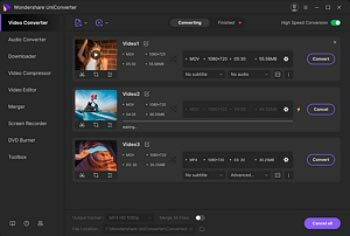 Online UniConverter (originally Media.io) is a totally free online website for video converting, editing, and compressing. It supports an array of video and audio formats so that you can convert MOV to AVI easily online and free. 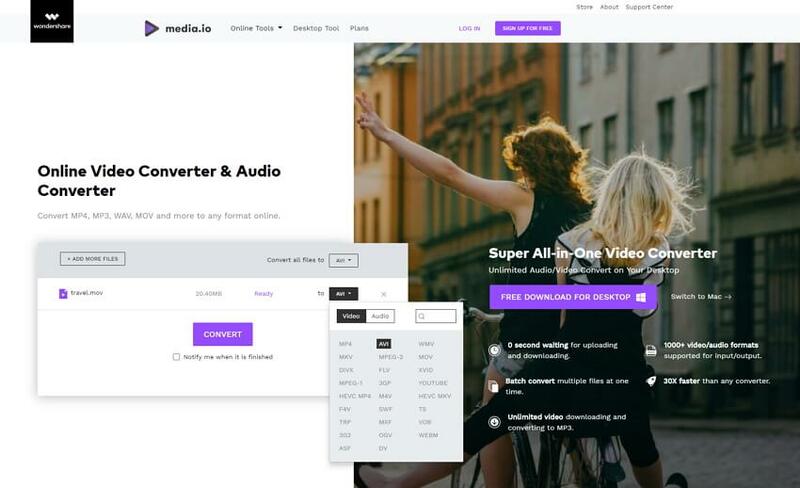 Just 3 simple steps to drag and drop the MOV files and finish the conversion within a few minutes according to your video length and internet connection. With Online UniConverter (originally Media.io), you can also edit MOV files with trimming, cropping, rotating, flipping, and more features. It works on both Windows and Mac system. IF you wish to convert MOV to AVI online, without having to download and install software on your computer, you can use online converter like Zamzar. 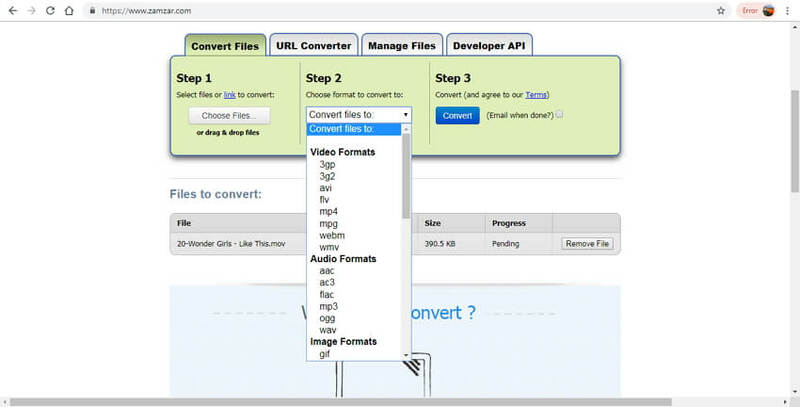 This online converter tool allows you to convert MOV to AVI by just using your web browser, with just a few clicks. When you upload your MOV file, you should select AVI as desired output format, and then enter your email address, where a link with your converted AVI file will be sent to. Zamzar also supports other video formats, so you can convert a variety of different video formats, all for free. Easy to convert MOV to AVI. You don’t need to install software to use it. You can’t convert files bigger than 100 MB or less for free. Slow speed as it depends on your network connection. Some online sites like Zamzar full of ads on its free version. Not support batch conversion more than 2 files. Even though both MOV and AVI are formats used to contain video files, Apple users use MOV more commonly, because it’s the default video format on Mac OS. 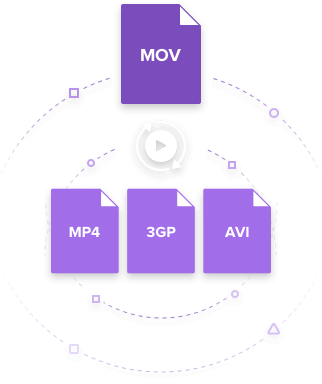 AVI, on the other hand, is more widely supported file, its widespread use and compatibility with a wide range of devices are the main reason making AVI one of the most used video formats. So, for converting MOV to AVI on Mac much better, Wondershare UniConverter (originally Wondershare Video Converter Ultimate) is your right choice as its full-quality output, 30X faster speed, batch conversion, and multiple functions. Free download and install it on your Mac and follow the simple steps in Part 1 when you're having many large MOV files need to be converted.